Rationalist campaigner Babu Gogineni (left) receives an award from Foundation for India Studies Chairman Krishna Vavilala (center) with event emcee Vishal Merchant. HOUSTON: If you’re reading this article, you are a well-educated and well-informed Indo-American. Nevertheless, do you believe in superstitions? Do you feel apprehensive if a black cat crosses your path? Do you check your weekly horoscope in newspapers and ward off accidents by tying a lemon and peppers on your new car? Most superstitions are harmless, but some like belief in witchcraft have harmful consequences if it results in the lynching of innocent men or women accused of practicing black magic. In fact, about 2,500 women were killed in 2016 for being “witches”. A celebrity battling superstition in India is Babu Gogineni. Based in Hyderabad, Gogineni is a humanist, rationalist, and human rights activist, who served as Executive Director of the International Humanist and Ethical Union (IHEU). 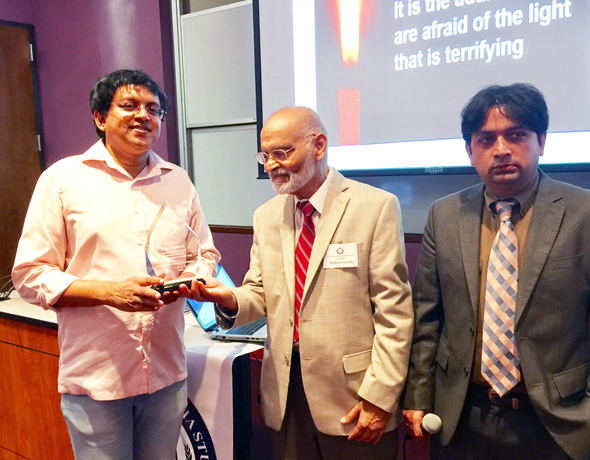 Gogineni presented a thought-provoking lecture on Saturday, July 1 at Houston Community College’s Alief campus on his efforts to combat superstitions. The presentation was sponsored by the Foundation for India Studies (FIS). The event was attended by FIS members and guests and several members of the Houston Humanists Association. To bring his campaign against superstitions to the attention of the masses, Gogineni was the host of a TV show called “The Big Question” broadcast in Andhra Pradesh. One of the interesting contests he hosted on the show concerned astrologers, who were so-called experts in predicting the future. The astrologers were asked 25 questions related to the outcome of the recent elections. The same questionnaire was given to a few 10th class students. Gogineni announced that he would concede to the astrologer’s predictive powers if they answer at least 11 questions correctly. It turned out that the astrologers could not get any more than three to four electoral contests correctly. In fact, the 10th class students beat the astrologers with about six predictions. Both set of contestants did not know that Gogineni had gamed the questionnaire with a few political parties that were not contesting any seats and a few fake candidates that were not event contesting. Gogineni touched on his human rights campaigns to help secure the release of Dr. Younis Shaikh, who had been sentenced to death for alleged blasphemy. He also publicly spoke on behalf of Bangladesh author Taslima Nasrin, for her progressive writings. Buddhist monk Dalai Lama is known for his spiritual teachings of world peace and nonviolence. However, Gogineni led a campaign against Dalai Lama’s selection of seven-year-old Indian girl Sambhavi as the reincarnation of a Buddhist goddess. Gogineni’s group filed legal cases in Andhra Pradesh High Court and the International Human Rights Commission. The campaign has ensured that Sambhavi is enrolled in a local school and not inducted in a monastery. In conclusion, Babu Gogineni urged the audience to learn about the South Asian Humanist Association and revealed plans to set up a university to teach rationalist and humanist thinking. For more information on FIS programs and activities, please visit www.foundationforindiastudies.org.